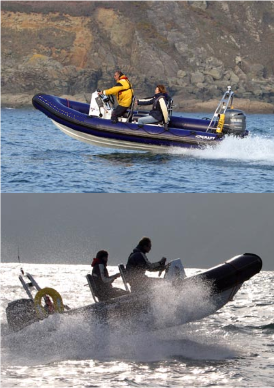 It is essential that everyone who drives a Club launch (Duncan, Shamrock), tender (Daffodil), or RIB (Gemini) follows the rules below, in order to comply with legal, safety, insurance, Salcombe Harbour, and common courtesy standards. This applies when operating the vessels at all times and there are no exceptions. Anyone who does not comply with these rules is jeopardising the Club, its Officers and its Members and will no longer be allowed to drive Club powerboats. You may also be risking a fine, prosecution, a civil action, and expulsion. The helmsman shall wear a lifejacket or suitable buoyancy aid at all times. For Daffodil and Gemini, the helmsman must always wear the kill cord. The maximum passengers for Duncan and Shamrock is 12 persons, plus helmsman. For Daffodil, the maximum is 4 persons total. The helmsman must be a Club member and be qualified to PB Level 2 or approved by the Club Secretary or Commodore. Only Club members, guests, and friends may be carried. No paying passengers or yachtsmen visiting Egremont are allowed. At all times keep a safe speed, do not exceed the Harbour Speed Limit (6 knots), and go slowly past moored vessels and in close proximity to other vessels. Remain within the Harbour limits (except Gemini). Obey the IRPCS (Collision Regs) at all times, and be prepared to give way, slow down, or stop at any time. Use of the pontoon at Normandy is limited to 30 minutes. Never leave a boat unattended. Do not stay longer than absolutely necessary. No smoking by anyone on any boat at any time. In the event of an accident or collision, please take full details of any 3rd party and circumstances of accident. Report immediately to Duty Officer and to Salcombe Harbour Office, using Salcombe Harbour Accident Report Form (downloads).